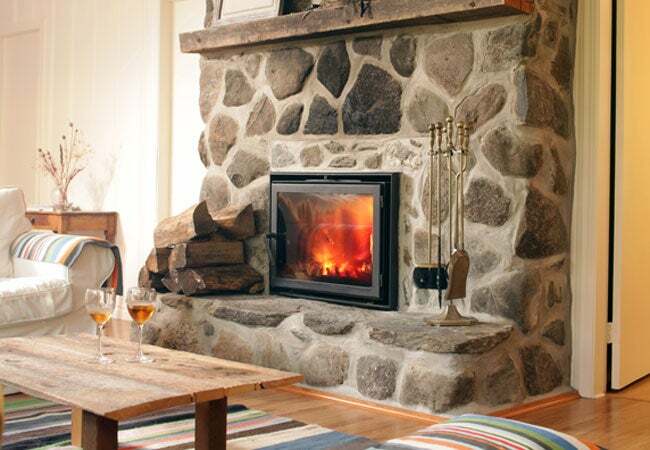 Adopt this cleaning routine so your stone fireplace roars with radiance all winter long. 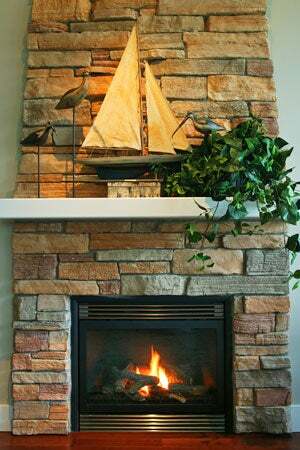 Dust and dirt may go undetected on the lighter patina of stone fireplaces compared with brick, but your fireplace must still be cleaned regularly. Microscopic pits found on the surface of natural stone such as granite, limestone, or slate collect their fair share of dust, dirt, soot, and creosote—a dark brown condensation of the by-products of fire (e.g., smoke or vapor) that can lead to chimney fires. Eliminating these accumulations on an ongoing basis—a relatively easy and inexpensive task—is the best way to maintain the beauty, efficiency, and safety of your hearth. So read on to learn how to clean a stone fireplace (as well as deep-clean it, as necessary) using supplies you already have at home. Always start with some fireplace preparation. Use this procedure to protect living spaces surrounding your fireplace and pre-clean the firebox (the chamber where the fire burns) and fireplace surround prior to either a routine cleaning or deep cleaning. Allow your fireplace to cool for a minimum of 12 hours after extinguishing the last fire. Then lay drop cloths on the floor around the fireplace and a tarp over nearby furniture to protect them from cleaning fluids and airborne dust. After donning gloves and a dust mask, use a small shovel to scoop up the remaining ashes from the firebox. Place ashes in a metal container with a tight-fitting lid. Fill the container with plain cold water, close the lid, then store it outside the home away from other flammable materials until you’re ready to discard them. Use a vacuum cleaner with a brush attachment to siphon dust from the fireplace surround, moving from the top to the bottom. This will reduce accumulations on the stone surface and speed up your cleaning. Then, follow fireplace preparation with your routine cleaning. 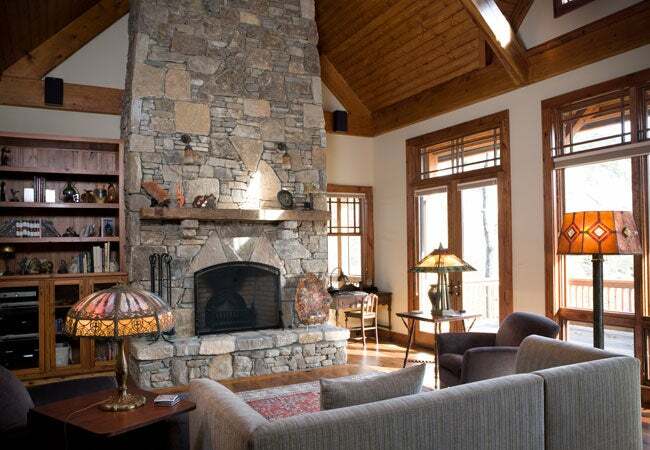 During seasons of regular use, go through these steps for how to clean a stone fireplace on a weekly basis to remove light to moderate accumulations of soot, dirt, and grit that collect on the fireplace surround with each cozy night by the fire. In a small bucket, dilute a quarter-cup of dish soap in a quart of hot but not scalding water. (The emulsifying agents in soap are all you need to clean a fireplace that’s not heavily coated with soot). Stir with a wood stir stick until the soap has dissolved. After donning gloves and a dust mask, dunk a clean scrub brush into the soap solution, then scrub down the fireplace surround from top to bottom to loosen trapped dirt and grit in the stone and grout. Empty the bucket of soapy water and replace it with fresh cold water. Saturate a clean rag in the water, then make one to two passes over the fireplace surround with the wet rag to wipe away soap suds and any loosened dirt. Dab the fireplace surround dry with a dry rag, then let the fireplace surround air-dry completely before igniting your next fire. Once a season, or as necessary, do a deeper clean. Heavy or hard-to-remove deposits of dirt, soot, and stains on the fireplace surround that are formed due to a lack of routine cleaning or persistent use after routine cleaning will warrant more powerful cleaning agents. 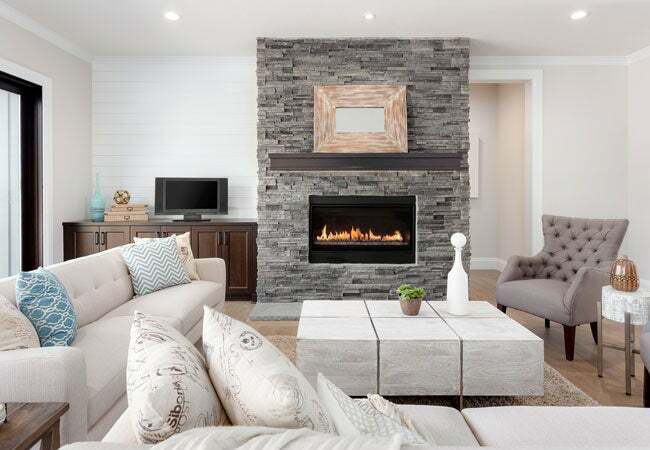 Deep cleaning should certainly be done before the first fire of each season you intend to use the fireplace (e.g., winter or fall) in order to eliminate creosote build-up in the firebox from prior fires. If you seldom or never use your fireplace, you can wait until an eighth-inch-thick layer of build-up is present in the firebox before deep cleaning the fireplace. Follow this procedure to deep clean the fireplace surround and firebox of your stone fireplace. After donning protective gear (including an old long-sleeved shirt and pants to protect your skin from TSP), combine a half-cup of TSP and three quarts of hot (not scalding) water in a gallon-size bucket and stir with a stick. TSP works as both a degreaser and heavy-duty cleaner, making it more effective than soap alone in eliminating stubborn smoke stains and creosote. To clean the fireplace grate and/or andirons (rails used to support logs), remove the grate/andirons from the firebox, then dunk a scrub brush in the TSP solution and gently scrub down the grate/andirons. Because of the high volume of sooty build-up that will be sloughed off the grate/andirons during scrubbing, you should ideally perform this step and Step 3 outdoors if possible. Go over the grate/andirons with a water-dampened rag to remove the TSP solution, wipe them dry with a dry rag, then return indoors and set them aside on one of the drop cloths you earlier laid down to protect the floor. Scrub the sidewalls, back wall, and floor of the firebox (from the top down on walls and from back to front on the firebox floor) with a dry scrub brush to loosen dirt and soot. Use a hand vacuum or a vacuum hose to siphon the debris that settled onto the firebox floor during scrubbing. Saturate a clean scrub brush in the TSP wash, then scour the firebox from the top down, including the sidewalls, back wall, and floor, to eliminate creosote buildup. Wipe the cleaned areas of the firebox with a water-dampened rag to remove the TSP solution, then dry these areas with dry rags and return the grate/andirons to the firebox. Dunk a clean soft sponge in the remaining TSP solution, then apply it to the entire fireplace surround, making sure to wet both the stone and the grout. Let the solution dwell for five minutes. Use a scrub brush to scrub down the fireplace surround from top to bottom to loosen dirt and soot. Make one to two passes over the surround with a clean water-dampened rag to remove the TSP solution. If stubborn stains persist on the fireplace surround, create a more highly concentrated TSP paste by combining once ounce of TSP with one cup of water in a small bowl, mixing with a wooden stir stick. Use a clean sponge to apply the paste in a thin layer to the offending stain, let it dwell for five minutes, and then scrub with a scrub brush. Wipe the stained area with a water-dampened rag until the paste has been removed. Dab the fireplace surround dry with the fresh rag, then let the fireplace surround air-dry completely before igniting your next fire.